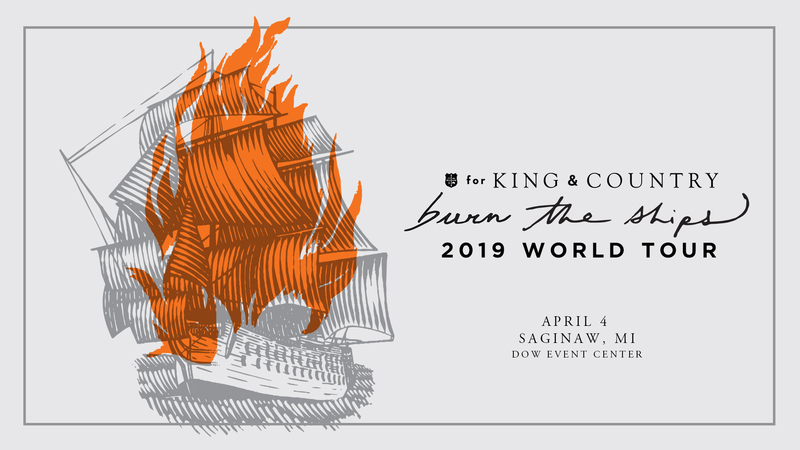 Thursday, April 4, 2019 at 7:00 p.m. | Doors at 6:00 p.m.
Two-time GRAMMY® award-winning Australian duo, for KING & COUNTRY, comprised of brothers Joel & Luke Smallbone, are gearing up to release their much anticipated third studio album, Burn The Ships,a sweeping musical landscape that explores themes of new beginnings, forgiveness, hope and love. The album’s soaring debut single, “joy,” held the No. 1 spot for four consecutive weeks, and has been streamed more than 12 million times. their previous album, the gold-certified RUN WILD. LIVE FREE. LOVE STRONG. debuted at No. 1 on iTunes, and produced two GRAMMYs®, four Dove Awards and a hugely successful 60-date arena tour. They have garnered four No. 1 hits, nine Top 10 hits and had songs featured on the Emmys, Super Bowl, Sunday night Football and other high-profile events, including performances on The Tonight Show, Today and Jimmy Kimmel Live! In October 2016, the Smallbone Brothers released the indie film inspired by their No. 1 hit of the same name, Priceless, about human trafficking. Artist Presale: Tuesday, November 27, 2018 at 11:00 a.m. – Thursday, November 29, 2018 at 10:00 p.m. Artist presale is only available to members of for KING & COUNTRY’s Fan Club. To sign up, please visit www.forkingandcountry.com. The artist presale is available online only at Ticketmaster.com with the artist presale code. Venue Presale: Wednesday, November 28, 2018 at 10:00 a.m. – Friday, November 30, 2018 at 9:59 a.m.
Venue presale tickets will be available online only at Ticketmaster.com with the venue presale code. The venue presale code will be released via email to all venue subscribers at approximately 10:00 a.m. on Wednesday, November 28th. 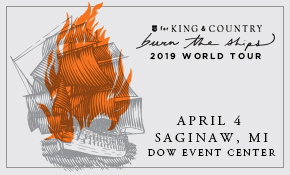 If you do not subscribe to The Dow Event Center email newsletter and would like to receive the venue presale code, please sign up for our emails at https://bit.ly/2LC76Y2 by Tuesday, November 27th at 11:59 p.m.